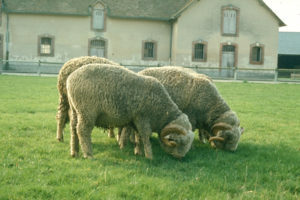 The Rambouillet is the “backbone” of the American Sheep Industry, forming the foundation of most western range flocks and raised throughout the United States. The Rambouillet descends entirely from the Spanish Merino. In fact, it is the French version of the Merino developed when Louis XVI imported 386 Spanish Merinos in 1786 for his estate at Rambouillet. When the Moors invaded Spain in the 14th century, sheep came along for the ride and left a great legacy: Merino sheep. Merinos were a closely guarded secret for the Spanish crown. But the Spanish didn’t have the processing capacity and some of the wool was sent to neighboring France. Concerned with Spain’s increasing industrialization, Louis XVI convinced the Spanish to give him a few sheep and when 318 ewes, 41 rams and 7 wethers arrived in October 1786, he established the research station in Rambouillet. Merino flocks were sent around the globe along with the Spanish Empire, but as Spain started to fail, so did the breeding programs. But the strain of Rambouillet in France retained the original features, and even got bigger and finer. In the mid 1800s, the first Rambouillets arrived in the United States where shepherds began crossing them with the now thinned merino blood to restore the merinos to the detriment of the Rambouillet and losing the fleece volume in the process. The Europeans, and those of similar mind, did not cross breed, keeping the strains separate. This created a rift in the Rambouillet breeding programs. The problem was that the crosses reduced fleece volume because the amount of grease was so high, leaving a black crust on the surface of the wool, the yield dropped off precipitously once the wool was cleaned. The Rambouillet standard was established to protect the purer bloodline that Louis created. Rambouillet should have wooly faces and legs, though they eyes should remain clear of wool the rest of the body should be wooly. The sheep can be polled or horned – but the horns must spiral gracefully to prevent crowding. There should be no folds on a Rambouillet’s large form, unlike its merino ancestors. Rams generally weigh 250-300 pounds and ewes 200-275. The ewes normally twin, sometimes more than once in a year. The fleece should be bright cream to white, uniform, dense, and high yielding with a long and fine staple of a minimum of 4.5” for a year’s growth. When the fleece is parted to review the staple on the sheep, little to no skin should show. Grade should be uniform across the fleece with a Bradford count of 60-64 in rams and 64-70 in ewes (editors not: transllate to microns). A fleece should weigh from 8-18 pounds with a yield of 35-55%.